The group Handicap International (now known as Humanity & Inclusion) has provided aid in Burundi for 26 years. (Above) Thierry, age 9, was born without his left leg and received a prosthesis from the group, which is now pulling out of the country. HI has been ordered by the government to stop its work in Burundi in a dispute over ethnic quotas. The government is requiring all foreign aid groups to commit to having 60 percent of their local employees be Hutus and 40 percent Tutsis – the quota for government agencies. The government is also demanding that foreign charities provide staff lists specifically identifying employees by their ethnicity. Rather than comply, Handicap International (which just recently changed its name to Humanity & Inclusion) is laying off all 105 of its local employees, shutting down its operations and pulling out of the central African nation. Two other organizations — human rights group Avocats Sans Frontières and a Belgian NGO called RCN Justice & Démocratie — have announced that they're also departing over the new requirements. The operation of dozens of other international aid groups remains suspended in a country where three-quarters of the population lives in poverty. The government initiative began on Sept. 27, when the head of Burundi's National Security Council, Gen. Silas Ntigurirwa, went on national television and said that foreign aid agencies were operating illegally in Burundi. "The National Security Council has decided to suspend all activities of these NGOs for a period of three months dating from October 1 to allow the institutions in charge of them to verify their compliance with the laws and rules in place," the general declared. Burundi is adjacent to Rwanda. Like its neighbor, it has a population that's predominantly Hutu with a smaller Tutsi minority. The country fought a violent civil war from 1993 to 2005 that was intertwined with the Rwandan genocide and had ethnic tensions at its roots. Last fall roughly 130 foreign aid groups were ordered to suspend their operations and reapply for permission to operate in the country. According to the government, 84 agencies had done so as of Jan. 1. Other charities that refused to go along with the new rules regarding ethnic quotas were told they were not allowed to work in the country in any way. "We were clearly told that if we do not share the ethnic origin of all our employees then we are not allowed to start again our operations," says Dominique Delvigne, who oversees HI's operations in Burundi as the group's geographic director for the African Great Lakes region. "We've never asked the staff to share their ethnic origin and we do not want to do it in this current context," he says. Ethnicity is not something that's officially noted on identification cards in Burundi as it was in Rwanda before the 1994 genocide. Opponents of the new rules say it's not the role or responsibility of foreign NGOs to collect this information. This clash between the government and foreign aid workers comes as tensions in the country have been escalating. Amnesty International says security forces routinely kill, abduct, torture and detain people. The economy is in a tailspin. Burundi posted negative economic growth for the last three years, according to the African Development Bank. In 2015, President Pierre Nkurunziza defied term limits and won a controversial third term. Last year, the Central African nation quit the International Criminal Court and ejected the BBC and VOA. Hundreds of thousands of refugees have fled since Nkurunziza's latest re-election. "It's very important to remember that the government in Burundi has been using ethnicity any time it's cornered," says a Burundian named Terry who now lives in the United States. He asked that his last name not be used because he still has family in Burundi and is concerned they could be harassed if he criticizes the government. Terry says there's still a lot of ethnic tension in Burundi, and he worries how the information that NGOs are being asked to collect might eventually be used. "It could be used to track people. It could be used to intimidate people," he says. "Or it could be used to kill or to identify people to be killed who are considered opponents." The new rules also require foreign aid groups to deposit a certain percentage of their annual budget in Burundi's central bank — seen as a rather blatant attempt to give the government access to much-needed foreign currency. In announcing the ethnic quotas for NGO staff, government officials said they are attempting to make sure that aid groups hire more Hutus, who traditionally have been underrepresented in some sectors. At the time of the initial announcement of the new rules, a spokesman for the president also accused foreign NGOs of spreading homosexuality and attempting to destabilize Burundi. Some of the NGOs do "nothing," he said, accusing one unnamed group of passing out only three chickens over the course of three years. Dozens of aid groups are still in negotiations with the government about their operating status in Burundi. Dominique Delvigne of HI says the decree has had a huge impact not just on aid workers, but on the whole country. "The effect of the suspension was immediate," he says. "We were not allowed anymore to work. We couldn't even go and work with our support staff in our offices. We really had to stop the activities." Agencies running hospitals and schools were allowed to continue, but all the other groups had to close their doors. At least three aid workers who ignored the order were arrested. "As you can understand it was a very hard decision to make," Delvigne says. But he says it was an important decision. The government's request for ethnic information on HI's employees was a "red line" he says they were not willing to cross. At least three international aid groups have pulled out of the African nation of Burundi. This, after the government ordered foreign aid agencies in Burundi to suspend their work until they provide information about the ethnicities of their employees. Ethnic tension in Burundi led to a brutal civil war between Hutus and Tutsis that started in 1993. NPR's Jason Beaubien reports that some aid groups have balked at the new ethnic reporting requirements. JASON BEAUBIEN, BYLINE: Last fall, the head of Burundi's National Security Council went on television and declared that foreign aid agencies were operating illegally in Burundi. Roughly 130 groups were ordered to suspend their operations and reapply for permission to operate in the country. According to the government, as of January 1, 84 agencies have done so. 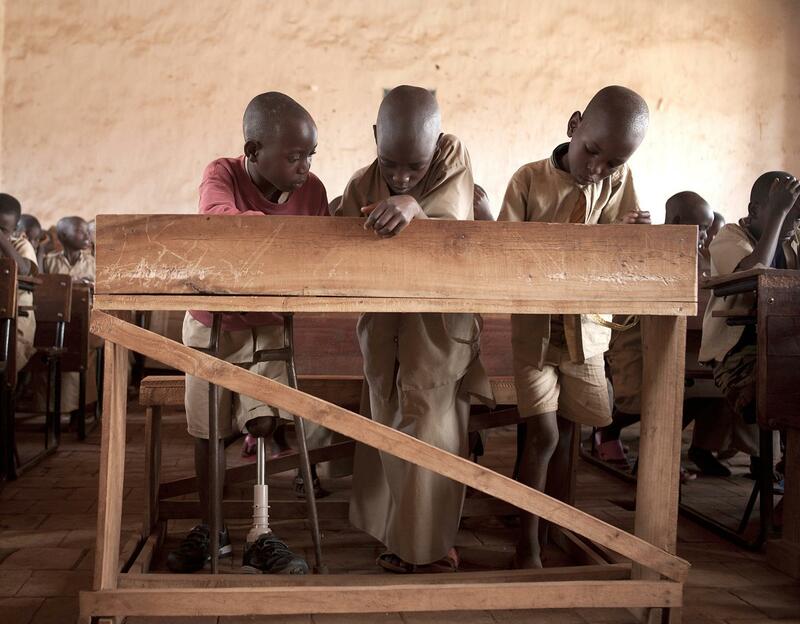 Humanity and Inclusion, which used to be known as Handicap International, is not one of them. DOMINIQUE DELVIGNE: We were clearly told that if we do not share the ethnic origin of all our employees then we are not allowed to start again our operations. BEAUBIEN: Dominique Delvigne oversees HI's operations in Burundi from the group's headquarters in Brussels. Burundi is demanding that HI and all other international aid agencies commit to having 60 percent of their local employees be Hutus and 40 percent Tutsis. Government officials say the move is an effort to make sure that Hutus get access to what are considered good-paying jobs at the charities. To comply with the ethnic quotas, foreign aid groups must provide the government with a list identifying each employee by their ethnicity. DELVIGNE: We never ask the staff to share their ethnic origin, and we do not want to do it in this current context. BEAUBIEN: There are concerns that these new registration requirements are part of an attempt by the Hutu-led government to control every segment of society. TERRY: It's very important to remember that the government in Burundi has been using ethnicity anytime it's cornered. BEAUBIEN: This is a Burundian named Terry, who now lives in the United States. He wants to only use his first name because of concern about retaliation against family members who are still in Burundi. Terry says it's disturbing to see the government asking NGOs to officially document who's a Hutu and who's a Tutsi. TERRY: It could be used to track people. It could be used to intimidate people. Or it can be used to kill or identify people to be killed who are considered opponents. BEAUBIEN: Amnesty International says this isn't an unreasonable fear. The human rights group says Burundian security forces routinely kill, abduct, torture and detain people. Despite a 2005 peace accord, tensions remain high in Burundi. The economy is in a tailspin. In 2015, the president defied term limits and won a controversial third term. Last year, Burundi quit the International Criminal Court and ejected the BBC and VOA. Hundreds of thousands of refugees have fled out of the country over the last three years. Officials didn't respond to NPR's requests for comment, but in announcing the new policy, a spokesman for the president accused foreign NGOs of not only ethnic bias in hiring but also of attempting to destabilize Burundi. In addition to HI, two other Belgian NGOs have announced that they're leaving. Dozens of others are still negotiating with the government. Agencies running hospitals and schools have been allowed to continue their operations, but all other groups had to re-register. HI is now in the process of laying off its staff of 105 local employees after 26 years in Burundi, shutting down its operations entirely. Jason Beaubien, NPR News. Transcript provided by NPR, Copyright NPR.